LACE AMI is a lace product series created by TAKAHASHI KEISEI CO. LTD. who manufactures a precise trimming die which enables one to cut out the outline of different kinds of materials with high accuracy. 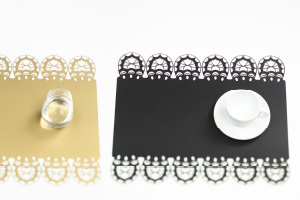 The special press technique of a factory in Yamagata has enabled the production of these refined lace tablemats. A variety of lace patterns are available and high-volume production is possible. The delicate and feminine design will add a soft and gentle touch to your table. 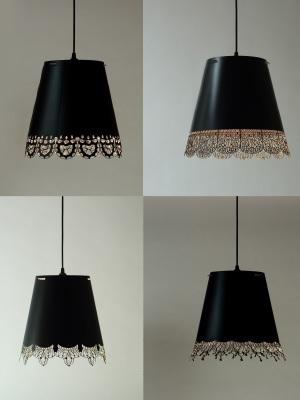 The special press technique of a factory in Yamagata has enabled the production of these refined lace lampshades. 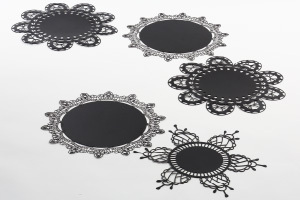 A variety of lace patterns are available and high-volume production is possible. The delicate and feminine light passing through the lace lampshade is very soft and gentle. Yamagata Prefecture is famous for the production of cherries, apples, pears and other fruits. Fujishiki Inc. started as a supplier of carton packages for fruit and developed innovative products bringing the material into play nowadays. They has original carton brand such as NECOTA. 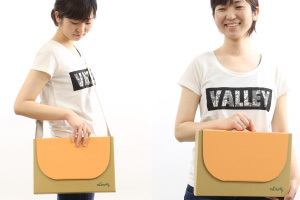 Document cases and bags made of Japanese recycled paper (cardboard) finished extremely finely. The Tamaya Seimen is a noodle factory located at the foot of Mount Gassan, almost in the center of Yamagata Prefecture. Since its foundation in 1949, Tamaya Seimen has produced both dried and fresh noodles such as soba (buckwheat noodles), udon (flour noodles) and ramen (Chinese noodles). The factory uses its own gristmill with a grindstone, which ensures that their soba noodles are always fresh. 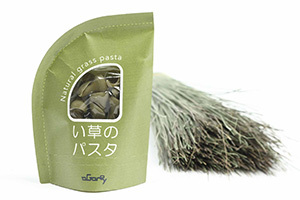 In 2006, a new factory with a low-temperature drying system was completed in order to produce more dried noodles and enabling them to produce fine soba noodles containing more buckwheat and high-quality dried pasta with a similar texture to fresh pasta. Moreover, they installed a precision-made pasta machine from Italy and began to produce short pastas as well. Tamaya Seimen always pursues the needs of the time and remains flexible to making the necessary adaptations for selecting the best and safest ingredients for their product. 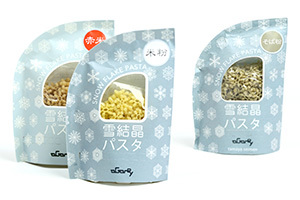 Cherishing both traditional wisdom and contemporary ideas, Tamaya Seimen will not cease to proudly accept any new challenges so as to continue producing the best noodles available anywhere. 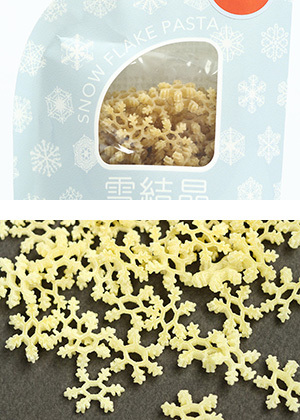 Short pasta in the shape of snowflakes. A mountain called “Gassan” lies in Nishikawa Town, Yamagata, and this is where the Tamaya Seimen Noodle Factory is located. Situated in a heavy snowfall area, the mountain is covered with “permanent snow.” On particularly cold winter days, large snowflakes flutter down from the sky. Every single snowflake has a different shape and looks like pieces of candy. The shape of snowflake pasta is ideal since the hexagonal shape can hold an abundance of sauce when cooked and this add more taste when eaten. Enjoying them with cream or tomato sauce will transport diners to the snowy mountains of Yamagata. 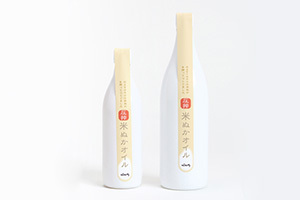 From 1956 to 2013, the company has been continuously awarded in the National Newly Brewed Sake Show: receiving the Gold Award for 4 years in a row, and has received the Gold Award 30 times in total, the Award of Excellence in the Tohoku Sake Show, the Gold Award in the National Sake and Condiment Show, the Gold Award in the Sake Appreciated with Wine Glass Award 2013, the Silver Award in the International Wine Challenge 2009, and more. It is also noteworthy that Yonetsuru’s sake was served as an official drink in the International Business Class of Japan Air Lines (JAL) for three months of the year from 2007 to 2011. 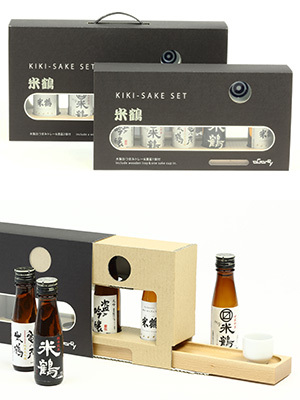 KIKI SAKE SET is a trial Japanese sake set in five small bottles of selected representative SAKE from YONETSURU. You can try different flavors and tastes from fresh aroma to dry flavor or mellow Daiginjo. It is suitable for both beginners and SAKE lovers to try 5 different kinds of YONETSURU’ representative sake. There are two types of sets : KIKISAKE SET with 5 bottles of 100ml and KIKISAKE SET-L with 5 bottles of 180ml. 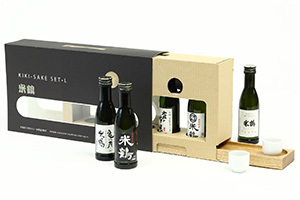 Both sets have different kind of Sake from Dry Junmai-shu to Junmai-Daiginjo-shu. Please enjoy the different taste and aroma of each type. 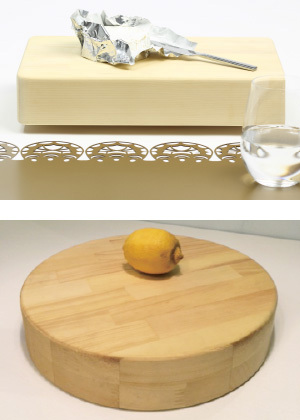 A set includes also a testing cup* and wooden tray for appetizers. Tatami has been used as flooring since ancient days. Tatami is made of natural rush grass(IGUSA) and its rush plant becomes Tatami using a long processes carried out by several skilled craftsmen. Japan made Tatami has a good aroma and is highly efficient for aromatherapy effect, humidity control, heat-retention and heat insulation. The moderate resiliency of Tatami is also an important factor for Japanese lifestyle where shoes are not used in the house. A dried plant and pot set for table decoration. The plant is a Japanese rush (igusa) which is the traditional material used for making tatami mats. 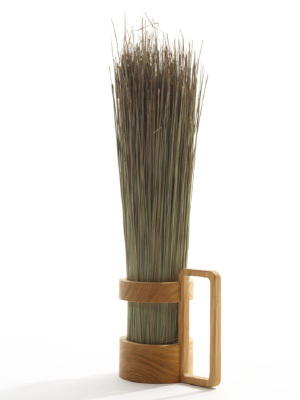 Similar to charcoal, rushes are porous and effective in absorbing odors and bad smells in the air. The plant’s color will gradually change to beige as time goes by but the absorbent effect will last for about three years. 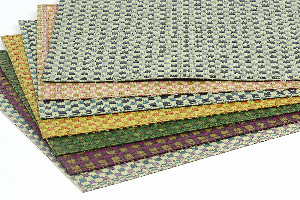 Traditionally, rushes (igusa) are used to weave tatami mats for the floor and people live on them. 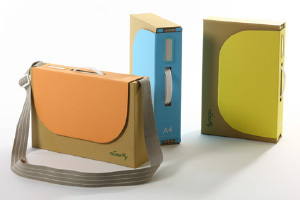 The IGUSA CUP series uses rush including the ear tip that is byproduct from the tatami mat production process. The aroma of this natural plant will soothe your mind and spirit. 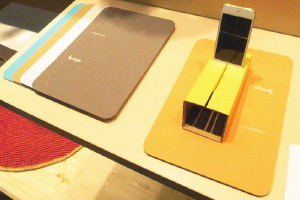 Tablemats made from rush – the traditional material used to weave Japanese tatami mats. 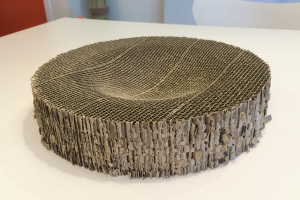 Using a more delicate weaving technique, the conventional tatami mat technique has been adapted to create tablemats with a natural texture. Enjoy the natural soothing aroma of Japanese rush. Surface is finished with urethane for waterproofing. 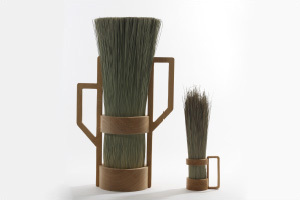 Yashiro-city in Kumamoto prefecture which is famous for growing reeds produces “Edible reeds”. 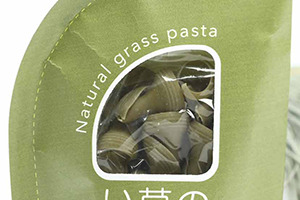 This pasta is made of edible reed powder. The pasta made of reed powder and semolina of durum wheat is chewy and when it is boiled, it becomes a fresh green colour with a clear and brisk aroma particular of reeds. It is a very healthy product full of fiber. Only cooking oil manufacturer in Tohoku region in Japan. Produce and sell “Rice oil” made from rice bran which is a safe material and well recognized the characteristic of “Rice oil”. Rice bran oil is a healthy vegetable oil made from brown rice husks and embryos. It is the only vegetable oil made from domestic non-genetically-modified materials. It is not only tasty but also light on the stomach. It is indispensable for Japanese cuisine. It is suitable for Tempura, frying to a crispy constitution. It can be used for dressing and mayonnaise without resulting in heaviness. It has a good oxidative stability and keeps fried foods, such as crisps, tasty for a longer period of time. It also includes oleic acid and linoleic acid which lowers cholesterol, vitamin E, tocotrienol and γ- orizanol which have an anti-oxidative effect. Orizanol is used for medicines, health food and natural food additives because it is effective for human health having an anti-oxidative effect and mildew resistance. This 450ml bottle of rice bran oil is made by an original press method using 9 kg of Japanese rice bran so it is a safe product without adding any fluxing material. It contains vitamin E, tocotrienol and γ- orizanol and plant sterol nicely. Please use as dairy oil for frying and stir-frying enjoying a light flavour and taste.